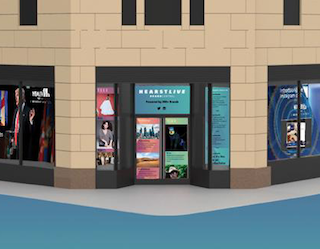 If you’re walking past the Hearst building tonight around 7 pm, it’s going to be impossible to miss HearstLive, a new multimedia display powered by seven million LEDs. HearstLive launches tonight and will feature curated content from the company’s many digital, TV and print brands. The display will also showcase social feeds from Hearst and direct consumers to HearstLive.com for deeper interaction. And trust us when we say you won’t miss HearstLive. It’s housed at the bottom of the Hearst buidling on the corner of 57th and 8th. On 57th street, HearstLive is 52 feet long and eight feet tall. On 8th ave., it’s 54 feet long and nine feet tall. It is giant.